It is very natural for human being to assume ownership to anything that is possessed by him or her, be it any thing; it is common foible of human mind. What we think and assume ours in this illusionary world is not absolutely ours. Read below what Baba says to one and all, a meaningful discourse on this by Shri Sai Maharaja . Kondya Sutar was a devotee of Baba who loved Baba in his own special way. 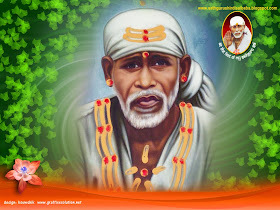 One day Baba asked Kondya to go to the Khalwadi (the place where the harvest is threshed) and put out the fire there. He said that the central stack of the harvest had caught fire. Frightened, Kondya rushed to the Khalwadi and made anxious enquiries but found no signs of fire. Returning, he complained to Baba saying that he had been put to unnecessary trouble and that his feet were scorched through walking in the hot sun. Baba replied," Listen. My words are never untrue. Look behind you and see the smoke for yourself. The harvest stacks lie close together in a heap but the central stack is on fire." It was a summer afternoon and a sprightly wind was blowing. Trees were breaking and roofs were flying. "Fire! Fire!" 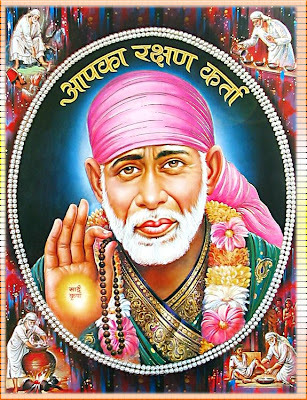 shouted the people of Shirdi as they rushed to Baba and begged him to save the harvest and thus save the people and the cattle of the village from hunger and death. Moved by their appeal. Baba got up at once and went to the 'Khalwadi." He poured water around the central stack which was on fire. He then said to the villagers. "Only this stack will burn. This one is the share of Agni. Do not try to extinguish the fire. No harm will come to the other stacks." Baba's words came true. By saving the rest of the stacks, Baba demonstrated his power over Agni. All the five elements are in fact under the control of holy -divine person like Baba. In the evening people came for Baba's darshan, Nanasaheb among them. Baba said to Nana, "O Nana, look at these greedy people. Today the harvest of the Bhagchand (the owner of the central stack) burned down to ashes, and here he is moaning his loss. Gain and loss, birth and death are all under the control of God. These foolish people do not realize this. They dance with joy when they gain and start crying when they lose. The joy as well as the sorrow comes of a feeling of ownership but it is meaningless to claim ownership. The burnt-down stack did not belong to the Marwadi. It consisted of hay which came into existence from seeds borne by the earth. The cloud watered them and the sun kneaded them into shape with his own hands. Thus, the earth, the cloud and the sun are the real owners of the stack. All things in this world are produced in this manner. We certainly are not their owners. Nana, ask the Marwadi why he is weeping over the loss of something which was never his and worrying me in the bargain. What the Lord gives with one hand, he takes away with the other. In our ignorance we think we are the owners of things and this sense of ownership is the root cause of our joy and sorrow. Shethji, go home now in peace. You will make good your loss in some other business." Everybody was pleased to listen to this discourse and understood the divine law of non-attachment to worldly matters.